Located on tranquil Toronto Lake near MacTier, L-luna Cottage has an inviting charm. It is situated on 14.1 acres with 1,400 feet of waterfront and offers a setting for hiking, exploring the lake and catching sight of a variety of wildlife. This property has an 1150 sq. ft. main cottage and a fully equipped 400 sq. ft. second cabin. The separate accommodation offers ideal space for vacationers with extended family. The kitchen is well-equipped with fridge, stove, coffee maker and Tassimo as well as the other tools needed for prepping, cooking and serving family cottage meals. The pine table and cabinetry make the kitchen a warm, cozy spot for sipping morning coffee. Warm pine panelling extends into the good-sized living room. There are two futons for seating and sleeping. There is a CD player and plenty of books and games. A wood burning stove provides both heat and a focal point. Wood is supplied and can be found in the wood shed. The large living room windows provide a view of family activity on the porch. The two bedrooms and bathroom are off the living room. There is a queen bed in one with a single bed tucked into a nook. The second bedroom has two single beds. The bathroom is four-piece with tub/shower and there is a washer and dryer in the basement. The porch is the spot to sit and relax with beverage in hand to enjoy sunsets and the fabulous view of the lake. It is L-shaped and there is plenty of seating for everyone…a three seater couch, a two seater couch, two wing chairs with foot stools and a futon couch. Open the windows and let the soft summer air in or exit the porch onto a 600 sq. ft. deck and get comfy in a Muskoka chair or lounger. There is sun all day with shade relief from the trees. A gentle, grassy slope leads to the water where there is a small sand beach for the kids to play and a dock. It is very private and gets sun all day. The lake bottom here is sandy and soft and there may be weeds further out. Only non-motorized boats are used. There is a paddleboat, canoe, rowboat and two kayaks available for exploring the lake. A flat grassy spot at the side of the cottage is ideal for lawn activities and a lakeside fire pit can be gathered around in the evenings for conversation and roasting marshmallows. Solar lights lead the way to the second cabin which has good privacy from the main cottage. There is a neighbouring cottage on the other side. The cabin has a 115 sq. ft. deck and is situated about 100 yards from the shoreline. It was renovated in 2015 and has a modern feel. The kitchen is equipped with a fridge, stove, coffee maker, dishes and other utensils needed for cooking. Meals can be enjoyed at the table with two chairs. The bedroom has a double bed and four-piece ensuite bathroom with tub/shower. There is a lovely view of the lake from the living room furnished with a futon couch for seating and sleeping. There is also a wicker chair here and one on the small porch. L-luna Cottage is an enjoyable spot for families and nature lovers who enjoy hiking, fishing, bird watching and canoeing. 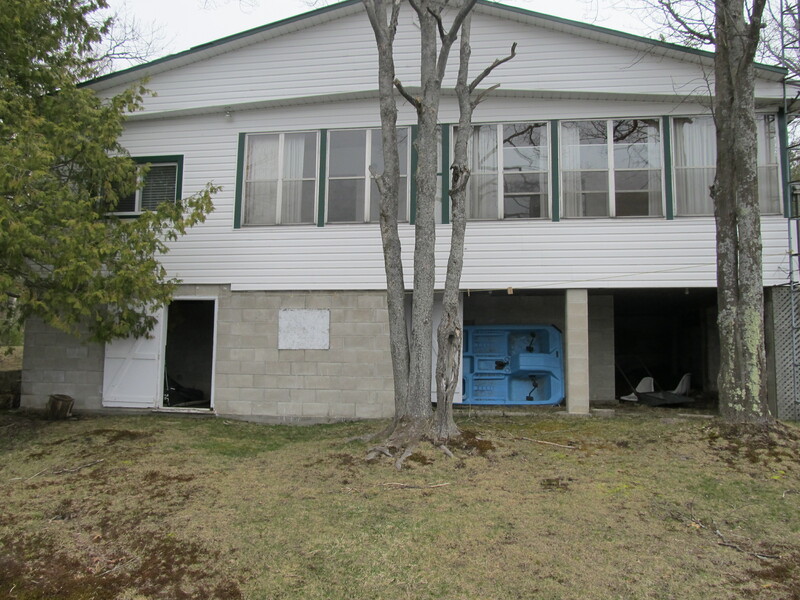 It is a private location on a small lake and yet has the convenience of the LCBO, Foodland, Home Hardware, Paramedics and OPP just a short drive away in MacTier. $1,495 per week during high-season (High-Season includes the last full week of June to Labour Day Monday, as well as the week of Christmas and New Year’s ). $980 per week during off-season.